Your Wedding Ring is the most important piece of jewellery you will ever wear. The circle, representing eternity, is worn on the third finger of the left hand, a tradition that stems from the ancient Egyptians who believed this finger held a vein that led directly to the heart. 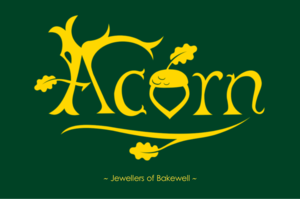 Many people who pop in to see us at Acorn think of a Wedding Ring as a plain gold band, this is a wonderful, traditional choice however if you fancy something a little bit different there are soooooo many options! Your Wedding Ring can be as unique as you are. 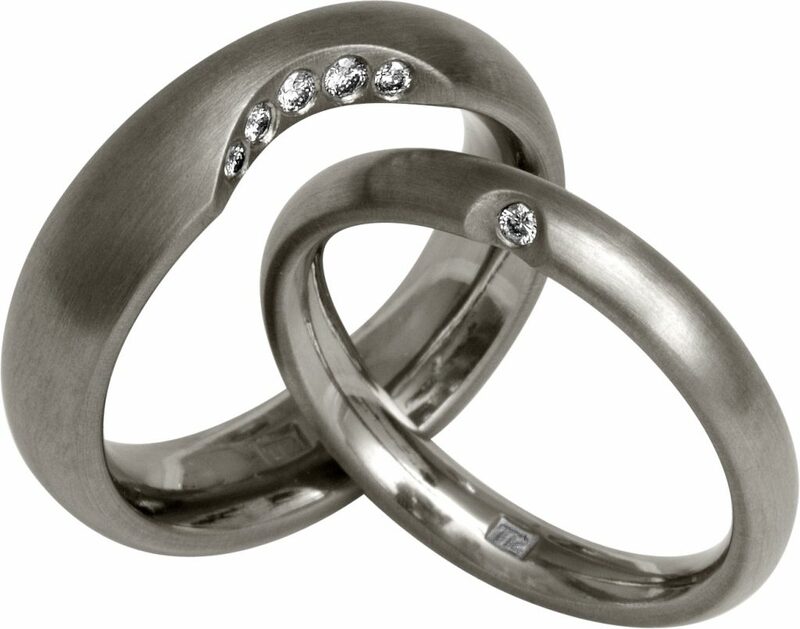 If possible set a time aside as a couple to look for your Wedding Rings. It can be a wonderfully romantic experience especially if you choose to book one of our Wedding Consultations with tea and cake of course! Try on as many rings as you can and ask a lot of questions, that’s what we’re here for and we love to chat about jewellery. When choosing your ring, think about your lifestyle. What do you do for a job? What are your hobbies? A rock climber will suit a different ring to a florist for example. If your job has strict regulations about jewellery think about a plain ring however if your Engagement Ring is very sparkly, diamonds set into your Wedding Ring will compliment it. Many of our Rings have been designed with different hobbies in mind, we have a collection tailored to people who sail and climb and a plain collection for those who work with their hands. If you have an Engagement Ring make sure that you wear it when you’re trying on Wedding Rings so you can see the overall effect. Although diamonds are a girls best friend there are lots of different gemstones to add sparkle to your Wedding Ring. Sapphires are available in many different colours and provide a bit of a ‘twist’ to a traditional band. Feel free to ask about different gemstones, many are suitable for everyday wear but occasionally we will offer an alternative if your chosen stone is soft or brittle. If you have an Engagement Ring that is a particular shape you may need a shaped ring to fit. Our Contour Collection has a beautiful selection of shaped rings with and without Diamonds which are designed to fit around Engagement Rings with a unique shape. 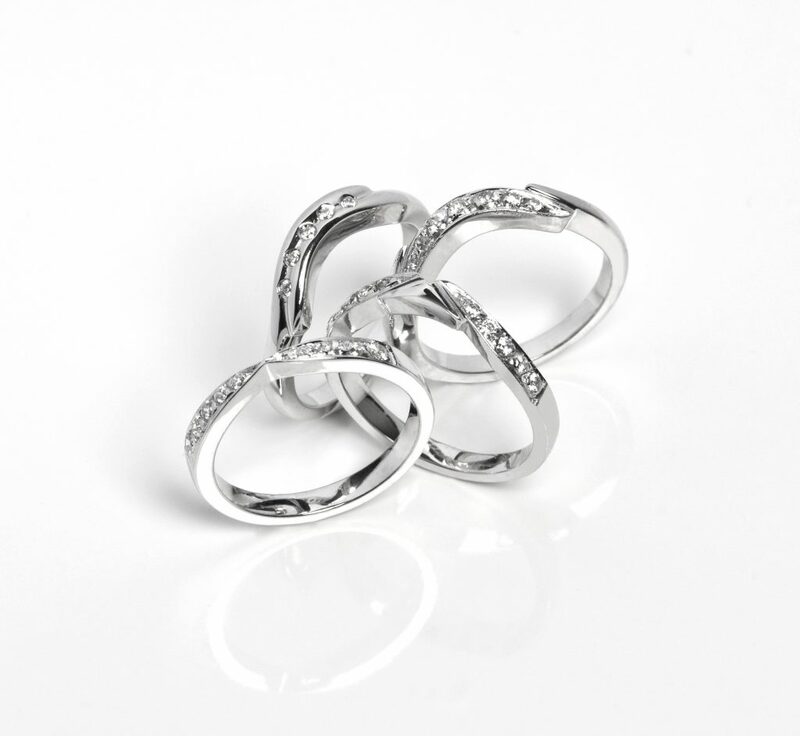 Each ring is available in a range of different precious metals and can be slightly adjusted to provide a custom fit if required. This is an ever growing collection so if you can’t see a ring that you like feel free to get in touch to see if we can help. 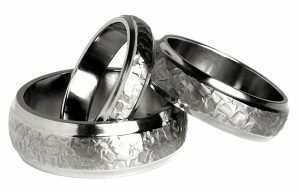 Many couples ask if they have to choose matching Wedding Rings, again this is a completely personal choice. Some couples do choose to have the same Ring, some decide to have the same but in different widths, one with diamonds one without, there are lots of possibilities but as with all of the other options we’ve covered, the decision is entirely yours. Many couples choose Wedding Rings that are completely different, if you want to ‘tie them together’ you can always choose a matching engraving on the inside of the ring. The most important feature of your ring is that it suits you as a person. Choose a Ring that you fall in love with. 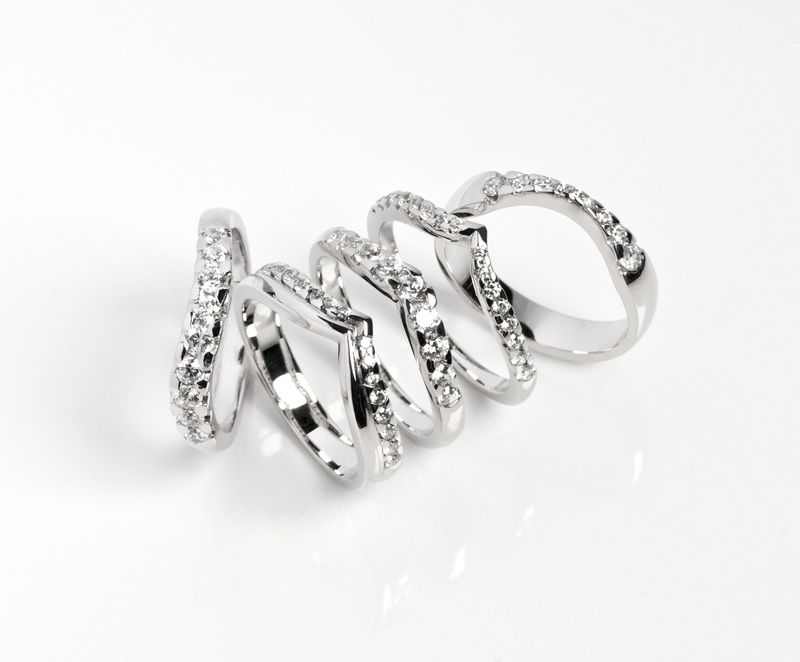 If you are looking for something completely different and can’t find the ring of your dreams from our stunning collections we can help to create a bespoke ring. Typically bespoke work can take from six weeks not including final fittings although depending on the time of year and complexity of the design this time frame can triple at least. If you are thinking about a bespoke piece, Contact Us to arrange your complimentary Wedding Consultation and we can have a chat about what makes the perfect ring for you. Another way to customise your Wedding Rings is with a personal engraving. We now offer laser engraving on all of our rings, this is in addition to a choice of traditional hand engraving and machine engraving. For a slight additional charge you can personalise your rings with fingerprints, inscriptions or even a secret message in your own handwriting. Working with the very best professionals in the field of engraving ensures that we can offer both traditional and cutting edge techniques. Remember, when it comes to choosing your Wedding Rings it’s all about you. This is such a special piece of jewellery that you will wear every day for the rest of your life, choose a ring that you adore! We’re here to help every step of the way, you can trust us to offer the very best advice to ensure that you have a wonderful experience and are delighted with the Wedding Ring of your Dreams. Feel free to get in touch and start your Wedding Ring journey today. « Acorn Answers – What is Palladium?